(HARRISBURG) – After voters re-elected all Republican incumbents and five new Senators last week, Senate Republicans strengthened their majority to the largest level in 66 years. 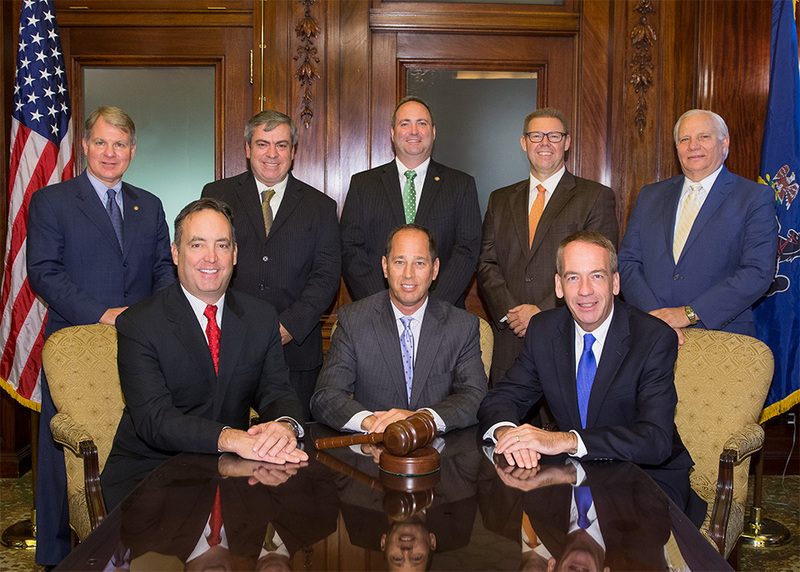 Today, Senate Republicans re-elected their leaders for the 2017-18 legislative session, retaining the current team to serve in their respective roles. Senator Jake Corman (R-34) will serve his second term as Majority Leader. His duties include overseeing the legislative agenda, developing policies and strategies for the Senate Republican Caucus, and playing a key role in floor debates. He will also have a major role in negotiating issues with the Administration and House of Representatives and in coordinating action on the Senate floor. Senator Bob Mensch (R-24) will continue to serve as Majority Caucus Chairman for the 2017-2018 legislative session. As chairman he presides over Republican caucus meetings to discuss bills and amendments and to develop caucus strategy. As the Majority Caucus Secretary, Senator Richard Alloway (R-33) oversees all executive nominations submitted to the Senate for confirmation. He will coordinate the review of the background and experience of nominees and ensure that proper documentation is submitted. Senator Chuck McIlhinney (R-10) will remain Majority Caucus Administrator and Senator David Argall (R-29) will continue to chair the Policy Committee. John DiSanto, 15th Senatorial District (Parts of Dauphin County and all of Perry County) — Senator-elect DiSanto owns and operates a construction, development and property management business. Born and raised in Harrisburg, he has been involved in numerous civic organizations. Wayne Langerholc, 35th Senatorial District (All of Cambria and Bedford Counties and part of Clearfield County) — Senator-elect Langerholc is a Cambria County Assistant District Attorney, heads up the Cambria County Drug Task Force and serves as a Richland Township Supervisor. Dan Laughlin, 49th Senatorial District (Part of Erie County) — Born Erie and raised in a housing project, Senator-elect Laughlin attended Penn State Behrend and worked day and night jobs in the construction and steel industry to support his family. He established and built from the ground up a family business, Laughlin Builders, formed a waste company, and operates an insulating business and rental company. Scott Martin, 13th Senatorial District (Part of Lancaster County) – Senator-elect Martin is Vice President of Business Development at Community Network Resources. He served for eight years as a Lancaster County Commissioner and as Chairman of the PA Republican Caucus of County Commissioners. Mike Regan, 31st Senatorial District (Parts of York and Cumberland Counties) — Senator-elect Regan served in the House of Representatives since 2013, representing the 92nd District and spent 23 years as a member of the U.S Marshals Service within the Department of Justice. Two Senate Republicans will retire at the end of the year. They are Senator Pat Vance (R-31) and Senator Lloyd Smucker (R-13), who was elected to Congress.